The Nintendo GameCube Microphone is an microphone accessory for the Nintendo GameCube, used to allow for vocal-based inputs in compatible software. 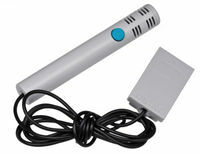 The microphone was released in 2004, bundled with compatible games such as Mario Party 6, Mario Party 7, and Odama. The Nintendo GameCube Microphone connects to the console using either of the two Memory Card slots. Near the top of the microphone is a blue button that, while held, allows it to receive vocal inputs that are interpreted by the game. All Nintendo-developed games use the Games Speech SDK developed by ScanSoft for speech recognition. Copies of Odama were bundled with a Microphone Holder (DOL-025), which allows the microphone to be mounted on the back of a Nintendo GameCube Controller while in use. The Microphone plugged into a Nintendo GameCube console. The microphone mounted on a Wavebird Wireless Controller. ↑ ScanSoft Speech Technology Enhances the New Mario Party 6 for Nintendo GameCube; Advanced Speech Recognition Enables Gamers to Interact with Game Characters Using Voice Commands. Business Wire (January 13, 2005). Retrieved February 23, 2017. This page was last edited on 24 February 2017, at 03:31.